So long as the system remains divisive with name calling and anger rather than communication and compassion, I fear that we will continue to be at a standstill. The moderates of both sides have been squeezed out of the power positions and the common person finds themselves holding their tongues lest they be labeled as a racist, fascist, liberal or conservative. Where is the common ground and the leadership that says, "Here are the things we can make progress on?" In absentia we see the preening and fawning for stage time, this grandstanding where each side points the finger at the other but nothing is ever solved. Can we please have a reasonable discussion where anger and blame aren't the currency of the conversation? Make no mistake that today that is the currency of media and politics. Please don't hold the working of the government hostage for the positions of your far edges. Please work together to agree on the things you can find common ground on and that this country needs. Work as leaders, negotiate, and remember you are elected to serve. The person that stands up today and can absorb the battering (at this point, probably of both sides) in order to bring real leadership back to the government will be revered in history as a courageous soul and hero, even as he or she is vilified by the masses. As leaders, what can we do to address the situation? What efforts can we make in our own areas of influence? Are there concrete efforts we can produce so that there is progress rather than feel good social media lip-service? And for everyone, rather than attacking people that don't have the same opinion as you, try to look at the other side, seeking comprehension. As I listen to Getting to Yes (affiliate link) via Audible, one of the lessons learned that the two authors make about negotiating is, there is great strength and even leverage in being able to comprehend and communicate the other side's position, to show that you have grasp of their perspective. It makes the other side feel heard and more likely to reciprocate, starting the basis for a real negotiation. 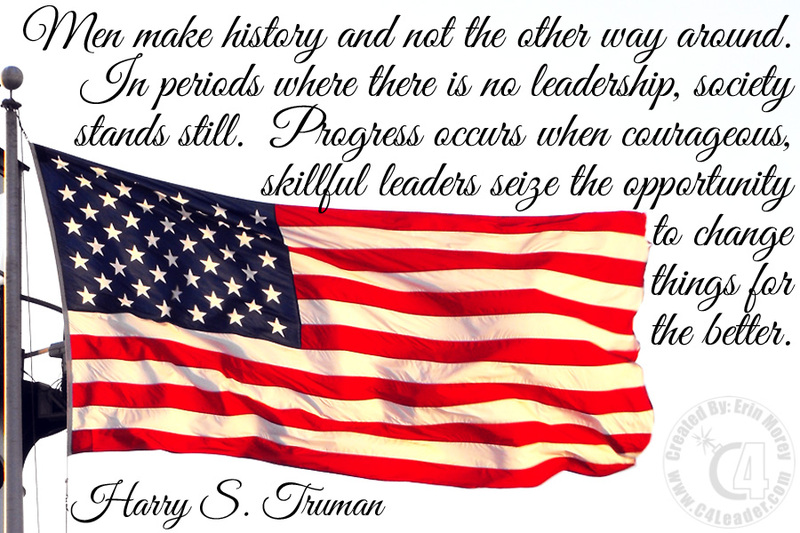 We cannot continue down this path of attack, otherwise our society will be torn apart, rather than at the standstill identified by Harry S. Truman. In this case, leadership may mean being the bigger man/woman and taking the attacks so that progress can be made. So, who among us will make history? Harry S. Truman was the 33rd President of the United States, taking over the office upon the death of Franklin D. Roosevelt. He assumed the presidency during the final months of World War II and oversaw the beginning of the Cold War. Implemented the Marshall Plan, established NATO against the Soviet Union, founder of the United Nations, and intervening in the Korean War. He also is the only world leader to use (2) nuclear weapons in war.